Affordable all-rounder. 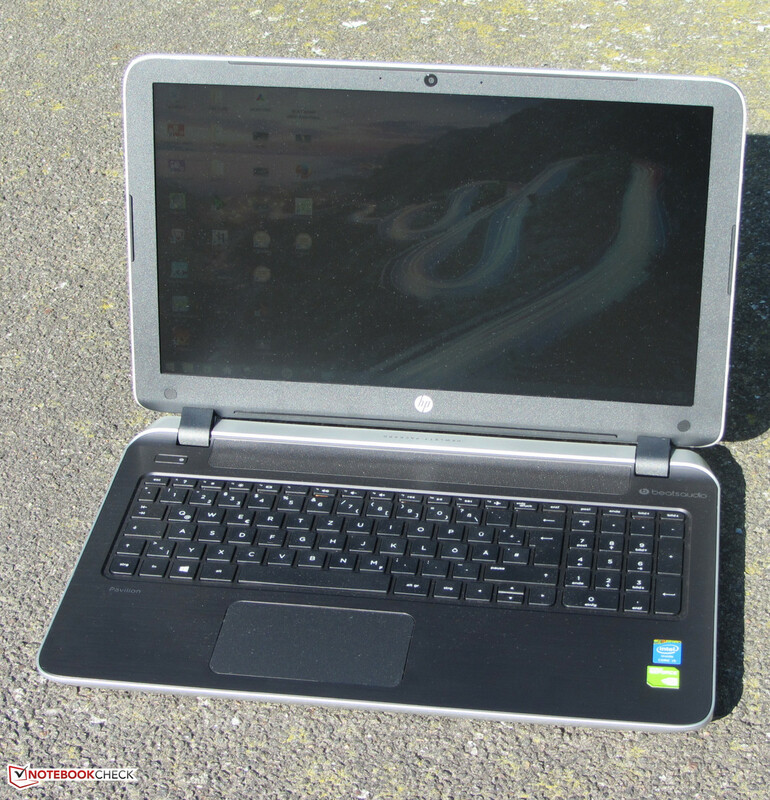 HP demands 500 Euros (~$647) for its all-round Pavilion 15 laptop. The buyer gets a Full HD screen alongside a GeForce 840M GPU, and a Core i5 processor. Can you really go wrong with this device at this price? Hewlett Packard adds a new device to its already extensive Pavilion 15 line. We have tested many models of this series. 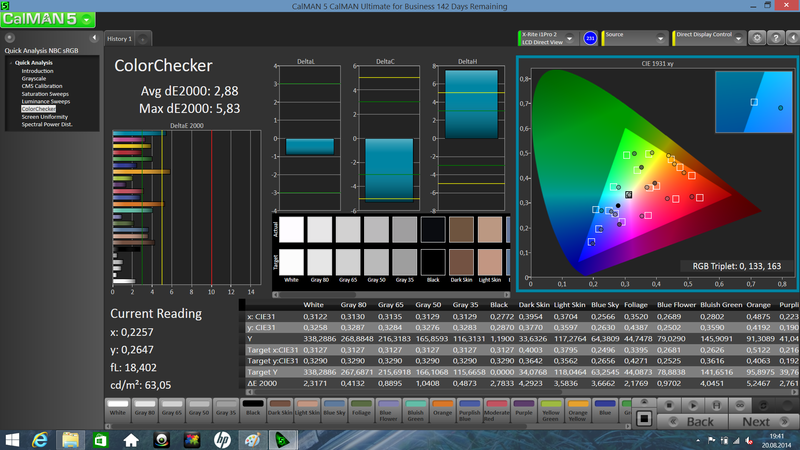 Although the casing's basic form has not been changed, HP relies on other colors and surfaces for its Pavilion 15-p008ng. 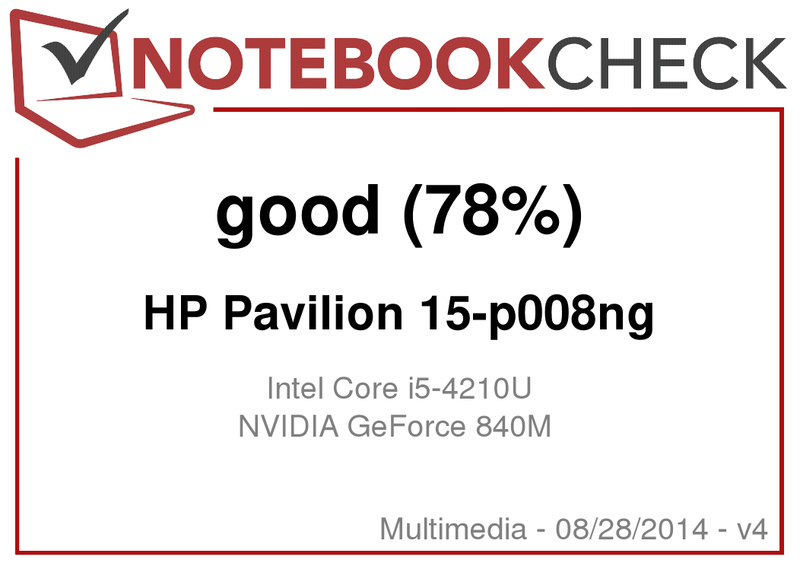 The Pavilion will seem familiar to regular readers of our website because it is, so to speak, the smaller twin of the recently reviewed HP Pavilion 17-f050ng (AMD A8-6410, Radeon R5). The Pavilion 15-p008ng tries to score with a gaming suitable GPU and a Full HD screen. 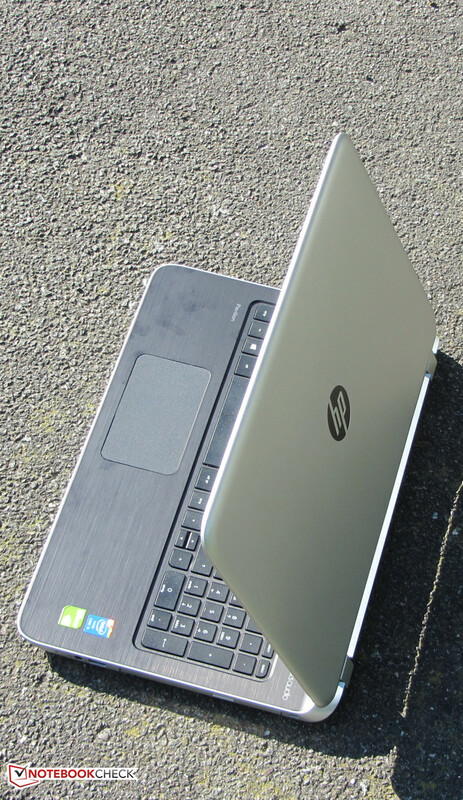 Our report reveals whether it succeeds, and whether the laptop convinces in total. The Pavilion is presently available for a price starting at 599 Euros (~$776). Contenders of this laptop would, for example, be Lenovo's IdeaPad Z50-70 (Core i7-4510U, GeForce 840M) and Acer's V5-573G (Core i5-4200U, GeForce GT 750M). 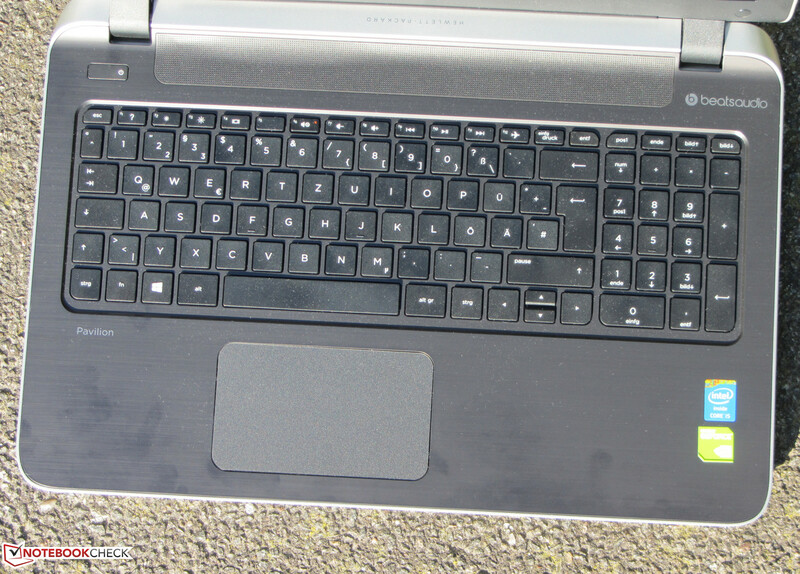 The IdeaPad model that we tested costs over 700 Euros (~$906). It is also available with a Core i5-4210U processor and then costs approximately 580 Euros (~$751, without a Windows operating system). The Aspire is currently also priced at only 580 Euros (~$751, without a Windows operating system). An updated version of the Aspire that relies on a GeForce GTX 850M graphics core is now available for a price starting at 699 Euros (~$905). The Pavilion 15 has the color and surface texture in common with the Pavilion 17-f050ng that we tested. The entire casing is comprised of plastic. The base unit's upper side features a dark charcoal-black color with brushed looks. The display's back and the underside are both silver colored. 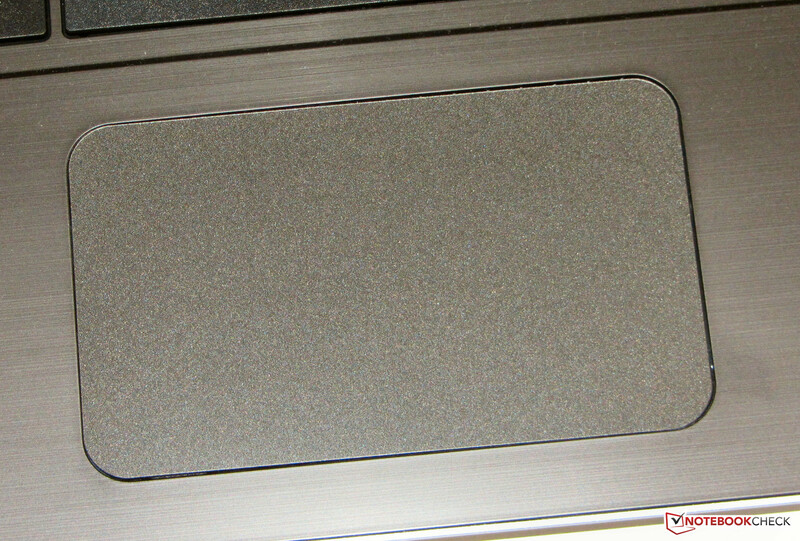 The lid's back is additionally covered with grooves. The Pavilion does not have a maintenance cover. We did not discover any major flaws in manufacturing or stability. Only the base unit has the weaknesses found in most laptops. 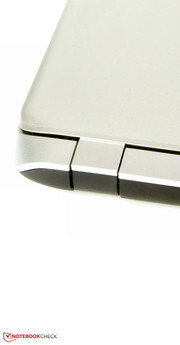 The casing can be dented slightly beside the keyboard and below the touchpad. 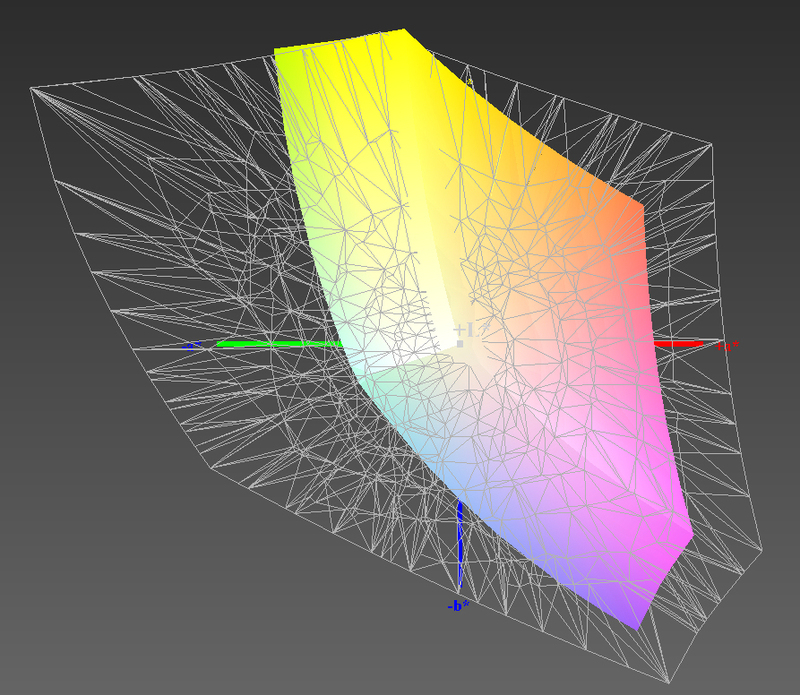 Furthermore, the base unit can be warped somewhat. However, that is all still within acceptable limits. The lid can be warped to a greater extent, which results in minor image distortions. The same happens when pressure is applied to the lid's back. The hinges keep the lid firmly in position, and opening the lid with one hand is just still possible. There is no maintenance cover. The interface configuration of our three comparison devices is largely identical. Only the owners of the Pavilion will have to live without a second video out. Only one HDMI port is installed. The Aspire additionally provides a Mini-Display port, and the IdeaPad has a VGA-out. The Pavilion also only offers one Fast-Ethernet port. The contenders can boast with Gigabit Ethernet. The positioning of the interfaces is not ideal; they are all on the same level as the wrist rest. The wireless module in the Pavilion has a Wi-Fi chip from Broadcom (BCM43142). It supports the 802.11 b/g/n Wi-Fi standards. There were no reception problems. The connection remained stable within a radius of 15 meters around the router. HP only installs a Fast-Ethernet chip in the Pavilion - Gigabit-Ethernet should be standard today. The laptop also sports a Bluetooth 4.0 module. The integrated webcam produces a slightly blurred image in resolutions up to 1280x720 pixels. Besides a quick-start poster, only a piece of paper with warranty information is found in the shipping box. The Pavilion is shipped with Windows 8.1 (64-bit) preloaded. A Windows DVD is not included. 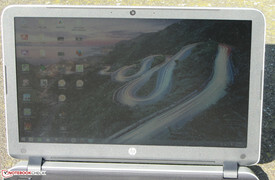 However, that can be created via HP's Recovery Media Creation software when required. It is also possible to order a DVD from HP for a charge. It additionally includes all drivers and the preloaded software. Users who still prefer Windows 7 over Windows 8.1 can relax - HP also provides drivers for Windows 7. The Pavilion does not have a maintenance cover. Users who want to access the laptop's innards will have to disassemble it. 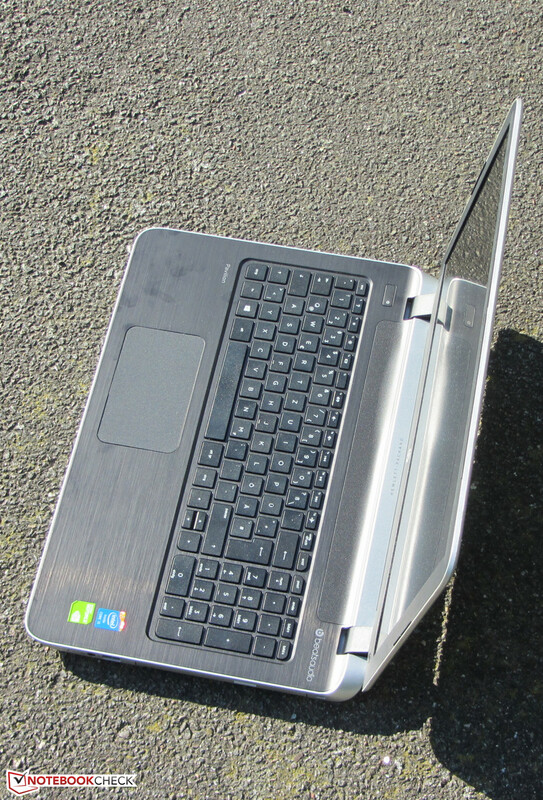 This is accomplished by removing all screws on the underside, and turning the laptop upright again. Then the base unit's upper side has to be removed carefully. Note: The upper side is connected to the motherboard with various cables. Finally, the hard drive, Wi-Fi module and BIOS battery can be accessed. The motherboard would have to be removed to reach the working memory. Users who want to open the casing should first look at the Pavilion's Maintenance and Service Guide. The exact procedure is described there. HP only includes a 12-month warranty on its Pavilion. That is too short. Nowadays, we expect at least 24 months. Both the Aspire and IdeaPad include a two-year warranty. It is possible to extend the Pavilion's warranty period; a two-year pick-up & return warranty costs approximately 66 Euros (~$85), and about 100 Euros (~$129) has to be shelled out for a three-year warranty. The Pavilion is equipped with an unlit chiclet keyboard. The level, lightly roughened keys feature a short drop and clear pressure point. However, the pressure point could be a bit more accurate. The keyboard yields very marginally while typing on it, which was not annoying in the test. In its whole, the Pavilion's keyboard is not one of the top models, but it is sufficient for non-professional use. Prolific writers should opt for another laptop. 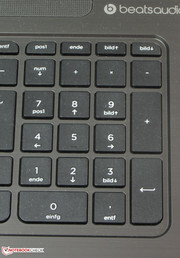 The multi-touch ClickPad (a touchpad without dedicated mouse keys; the entire pad is a button) in the Pavilion takes up an area of approximately 11 x 6.5 cm. That allows easily using multi-touch gestures. The pad's sleek surface does not prevent the finger from gliding. The different multi-touch gestures can be turned on and off singly in the pad's configuration menu. Not all gestures are enabled by default. 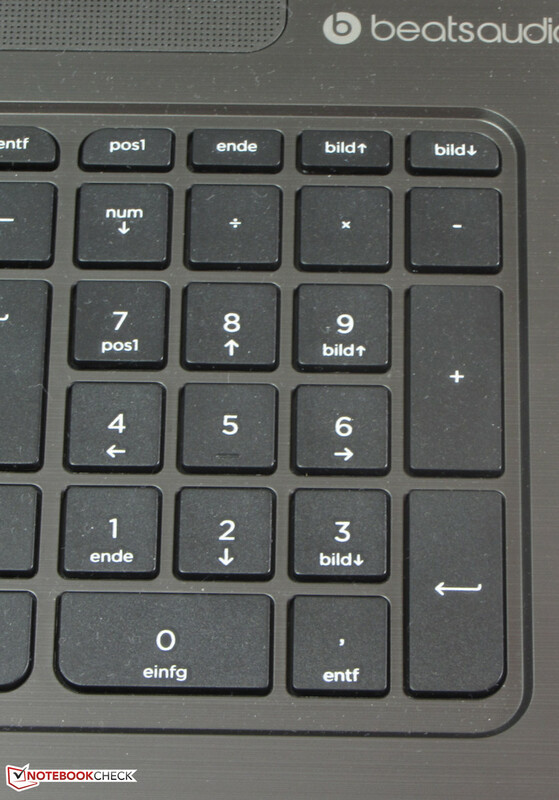 The ClickPad features a short drop and a clearly audible and palpable pressure point. 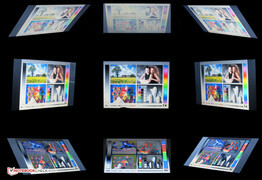 The Pavilion features a matte, 15.6-inch screen that operates with a resolution of 1920x1080 pixels. 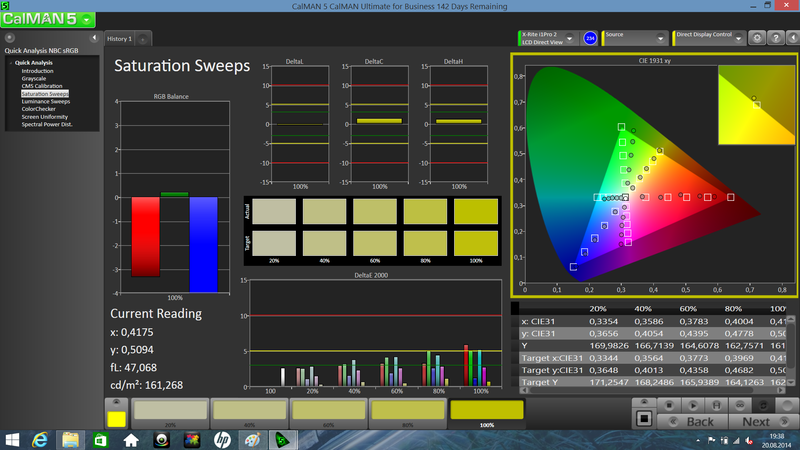 The high brightness of 329.4 cd/m² is pleasing. The Aspire (278.4 cd/m²) cannot quite compete with that, but does not provide a bad rate either. However, the IdeaPad (192.3 cd/m²) delivers an unacceptable rate. Both the contrast of 336:1 and black level of 1.02 cd/m² do not look that good in the Pavilion. The IdeaPad (546:1; 0.37 cd/m²) and particularly the Aspire (1196:1; 0.24 cd/m²) score better here. 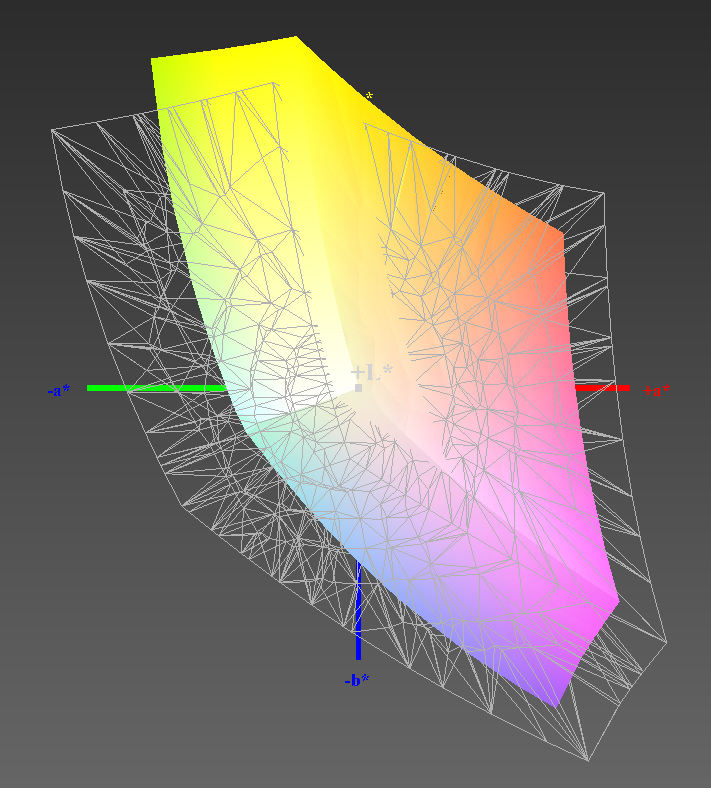 The Pavilion's screen cannot reproduce either the AdobeRGB or the sRGB color spaces. The coverage rates are 64% (sRGB) and 46% (AdobeRGB). The screen's average DeltaE 2000 shift in state of delivery is 10.9. We measure these high rates in most screens. Furthermore, the screen exhibits a bluish cast. 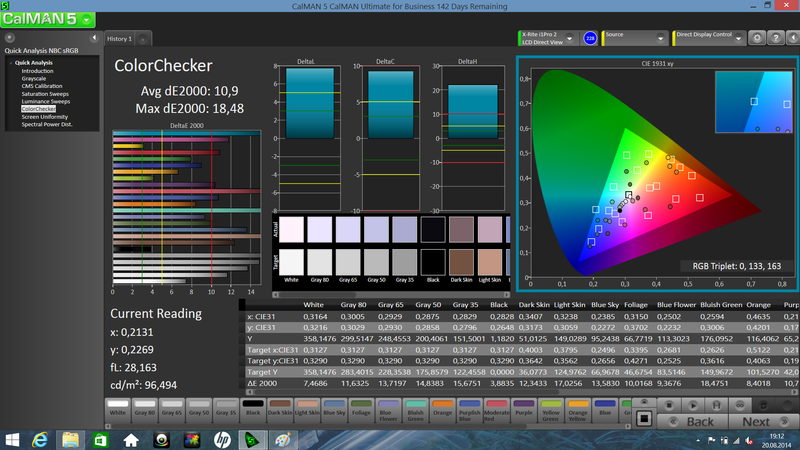 Calibrating the screen leads to considerable improvements. The DeltaE 2000 shift then drops to 2.88, which is within the target range (DeltaE less than 3). The bluish cast also disappears. The Pavilion is equipped with a simple TN screen, and it can thus only provide limited viewing angles. This is different in the Aspire, where an IPS screen is used that can be read from every position. It is possible to work with the Pavilion outdoors owing to the screen's high brightness and matte surface. The screen still remains fairly legible even in direct sunlight. 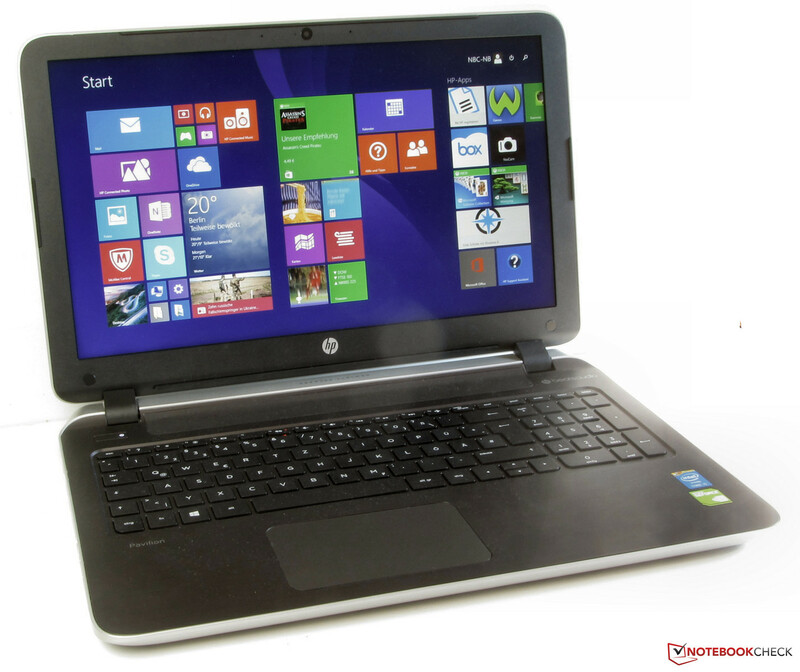 Hewlett Packard has a 15.6-inch, all-round laptop available with the Pavilion 15. The laptop even makes a very good impression when used for gaming, owing to the installed GeForce graphics core. Our review sample is sold for a price starting at 599 Euros (~$776). 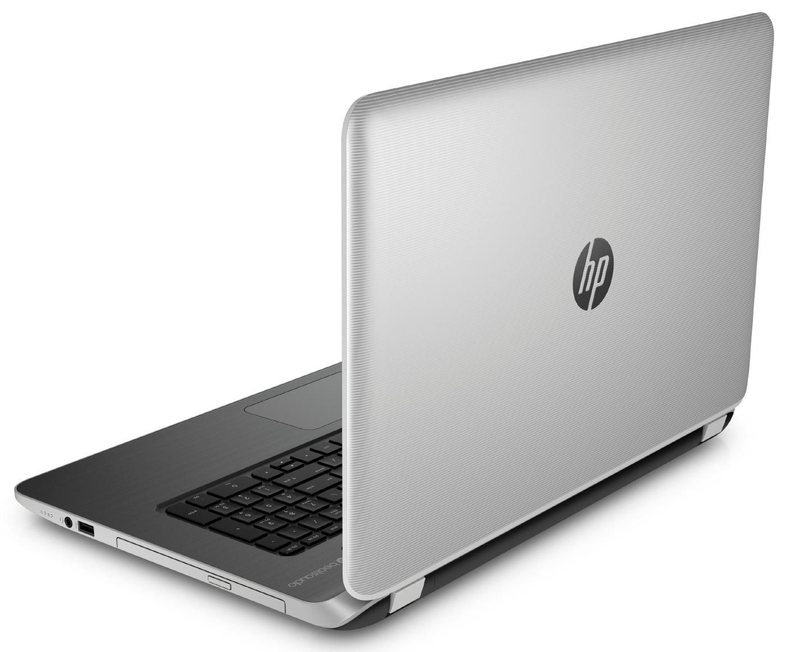 HP also offers a vast number of other laptops within the Pavilion 15 line. The Pavilion is powered by a Core i5-4210U (Haswell) dual-core processor. It is a marginally faster version of the well-known Core i5-4200U processor. The Core i5-4210U clocks with a base speed of 1.7 GHz and can increase its speed to 2.4 GHz (both cores) and 2.7 GHz (one core only) via Turbo. 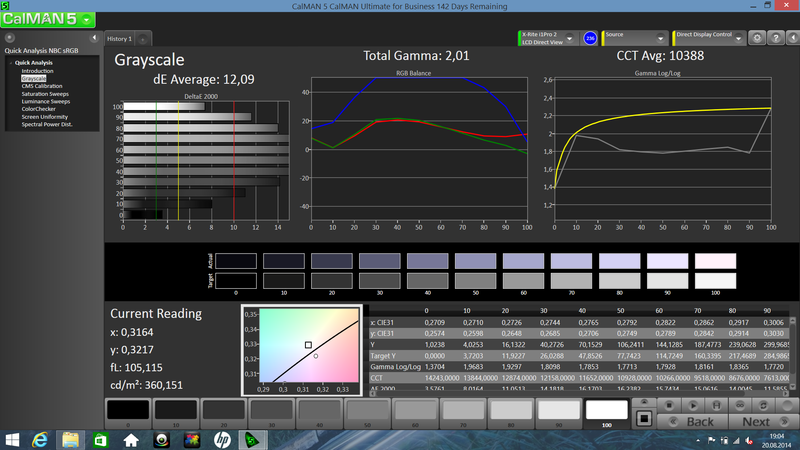 Both the base speed and Turbo levels are 100 MHz higher than that of the Core i5-4200U. The Core i5 chips are members of the ULV processor range and operate with a low voltage. Consequently, their power consumption is relatively low. Intel specifies a TDP of 15 watts. We use the Cinebench benchmark CPU tests to ascertain whether the processor's computing power can be retrieved. The processor performed the single-thread test with 2.4 GHz. One core was occasionally boosted to 2.7 GHz. The multi-thread tests ran stably at 2.4 GHz. This behavior applies to both AC and battery mode. Thus, the CPU's full performance is available. No problems occurred, and the system ran smoothly. The PCMark benchmarks underline this good subjective impression. An even higher speed could be achieved by installing a solid state drive. The system would then operate considerably swifter and Windows would boot faster. Hewlett Packard uses a hard drive from Hitachi's Travelstar 5K1000 line in the Pavilion. It has a capacity of 750 GB and spins with 5400 revolutions per minute. CrystalDiskMark recorded a read speed of 94 MB/s, and HD Tune delivered an average transfer rate of 91 MB/s. Both are normal rates for a 5400 rpm hard drive. Two graphics chips are installed in the Pavilion: Intel's HD Graphics 4400 GPU and the GeForce 840M graphics core. Both cores form an Optimus array. Intel's GPU is used for routine tasks and in battery mode. The GeForce core is enabled for performance-demanding applications like games. The user can, however, define which GPU is to be used. Both cores at least support DirectX 11. The GeForce core is a member of the GPU mid-range. It operates with a base speed of 1029 MHz, which can be increased to 1124 MHz via Turbo. The 3DMark scores are as we know from this hardware platform. The GeForce 840M GPU scores considerably better than its direct precursor - the GeForce GT 740M graphics core. The 840M chip achieves an averagely 20% higher score. The Core i5 processor and GeForce GPU turn the Pavilion into a gaming-suitable laptop. Most current games can be played smoothly in the HD resolution and using medium to high quality settings. The screen's native resolution can only be used in a few games. Particularly titles that only have moderate hardware requirements also run in the whole splendor of Full HD. These, for example, include the various representatives of the FIFA series and Counter Strike: Global Offensive. Users who need more gaming power should take another laptop. For example, the updated version of Acer's Aspire V5-573G would be recommended. It sports a Core i5-4210U processor and GeForce GTX 850M graphics core. The laptop is available for a price starting at 699 Euros (~$905) without a Windows operating system. The Pavilion's fan spins very subtly when idling and is barely audible. That, however, changes as soon as the laptop is loaded. 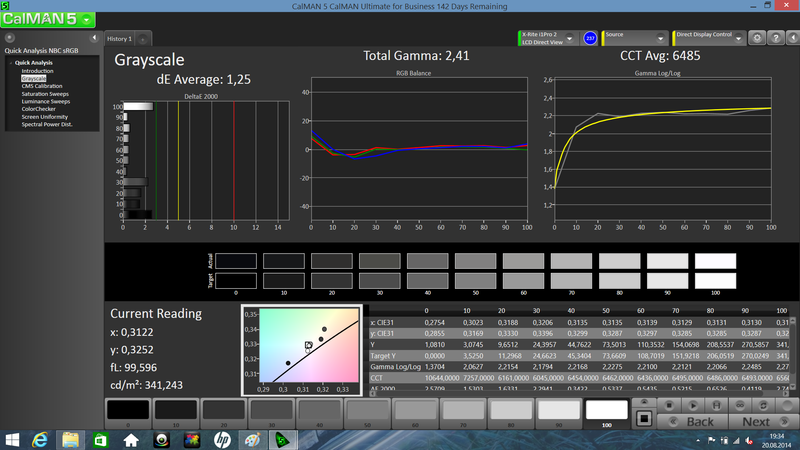 The noise level increases to 41.5 dB(A) in medium load via 3DMark06 and 43.6 dB(A) during full load via Prime95 and Furmark. The user will not be distracted by whistling or beep noises though. The Pavilion in the stress test. The fan's considerably faster speed during load also has a good side: the Pavilion barely heats up. 40 °C was only exceeded on two measuring points during the stress test. This fact suggests that the CPU and GPU are throttled, which is wrong in this case. It looks even better in idle mode. The casing's temperatures remained consistently below 30 °C. The Pavilion performed the stress test (Prime95 and Furmark run for at least one hour) the same way in both AC and battery mode. The CPU clocked with 2.2 to 2.3 GHz, and the graphics core ran permanently with its full Turbo speed of 1124 MHz. 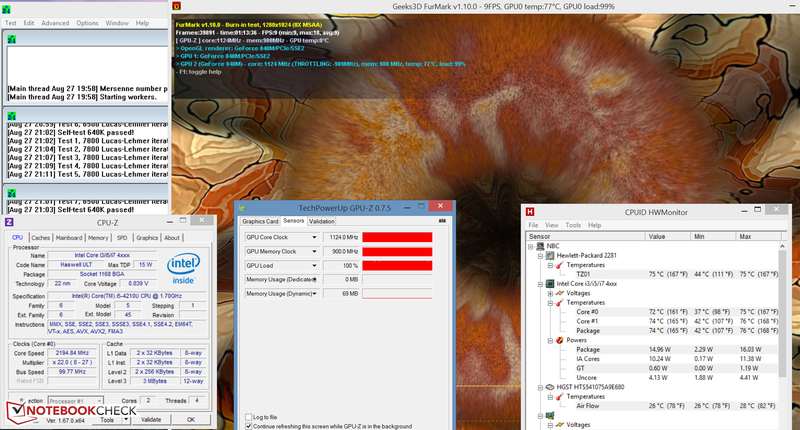 The CPU's temperature settled to roughly 74 °C during the stress test. (±) The average temperature for the upper side under maximal load is 34.3 °C / 94 F, compared to the average of 30.9 °C / 88 F for the devices in the class Multimedia. (+) The maximum temperature on the upper side is 39.6 °C / 103 F, compared to the average of 36.5 °C / 98 F, ranging from 21.1 to 71 °C for the class Multimedia. (-) The average temperature of the palmrest area of similar devices was 29.1 °C / 84.4 F (-4.7 °C / -8.4 F). The Pavilion's stereo speakers are located above the keyboard behind a perforated cover. A "Beats Audio" logo is displayed beside it. 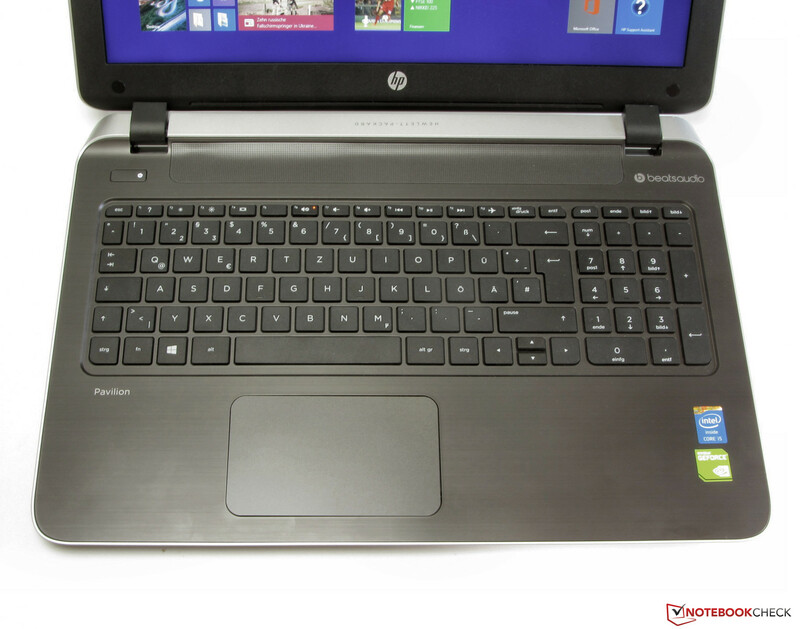 The laptop is shipped with preloaded Beats Audio software that should improve the sound. Basically, the speakers produce a rich, balanced sound that lacks some bass. It is possible to listen to the speakers easily even for a longer time. No surprises emerged during the energy assessments. The Pavilion's idle power consumption is below 10 watts. It has this in common with most Haswell laptops. The power requirement did not skyrocket during load either and is on par with comparable laptops, such as the Aspire E5-571G-536E. 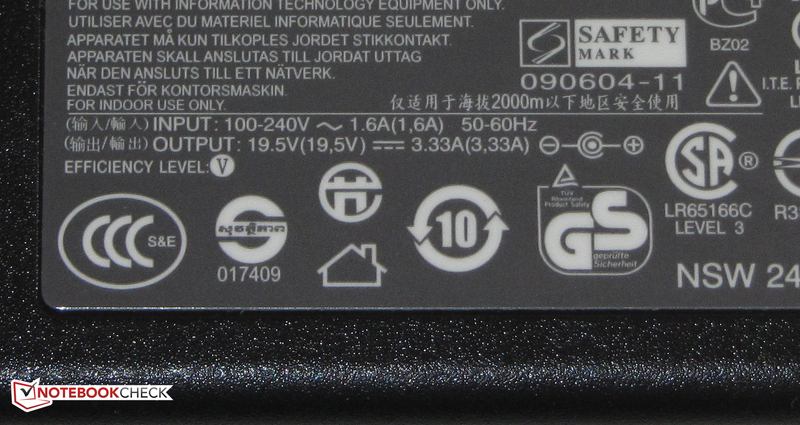 There are even some reserves because the Pavilion's power supply has an output of 65 watts. The Pavilion's battery lasted for 8:41 h in idle mode, which is on par with the Aspire (8:47 h). The IdeaPad lasts considerably longer (11:12 h). Idle mode is simulated via Battery Eater's Reader's test using the screen's minimum brightness, enabled energy-saving profile, and disabled radio modules. The Pavilion shut down after 1:40 h of load. 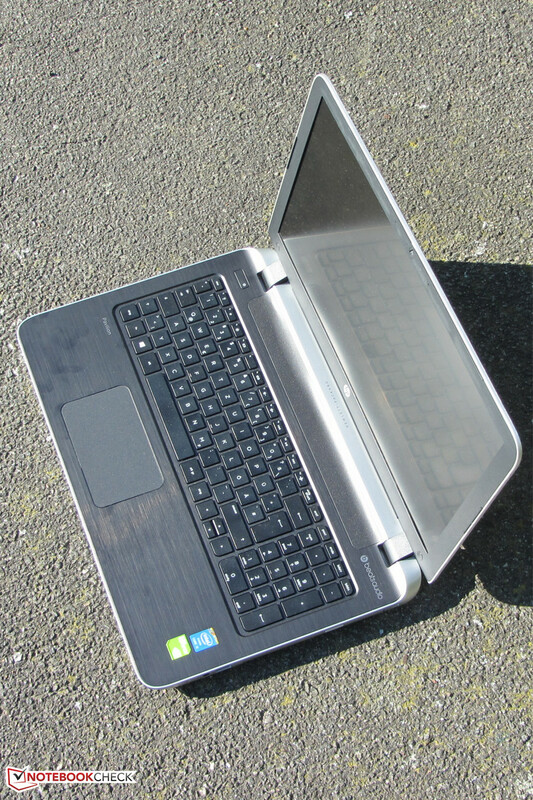 The IdeaPad achieves a similar time (1:37 h), and the Aspire has the longest runtime (2:05 h). The load runtime is ascertained using Battery Eater's Classic test with the screen's maximum brightness, high-performance profile, and enabled wireless modules. The Pavilion stopped the Wi-Fi test after 4:45 h. It is again on par with the IdeaPad (4:41 h). The Aspire shuts down considerably later (7:09 h). 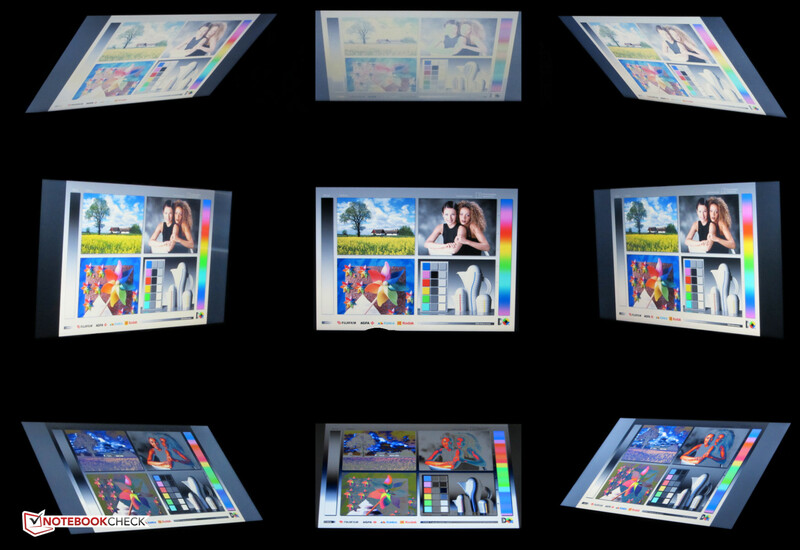 Websites are opened automatically every 40 seconds using the energy-saving profile, and a screen brightness of approximately 150 cd/m² in this test. We check the video playback time by running the short movie Big Buck Bunny (H.264 encoding, 1920x1080 pixels) in a loop. 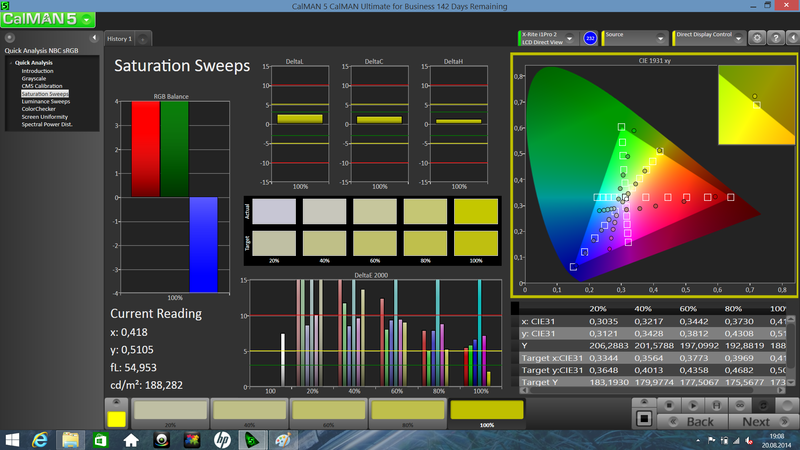 The energy-saving profile is enabled, the radio modules are off, and the screen's brightness is set to approximately 150 cd/m². Here the Pavilion managed 4:47 h. We did not perform this test with the contenders. In total, the Pavilion scores with good battery runtimes. It is no surprise that the Aspire can present the better runtimes because its battery has the highest capacity among our comparison devices (HP and Lenovo: both 41 Wh; Acer: 53 Wh). 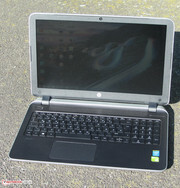 The buyer will find a decent, all-round laptop for a price of 599 Euros (~$776) in the Pavilion 15-p008ng. The Core i5 processor and GeForce 840M graphics core provide the necessary computing power in everyday life as well as in performance-devouring applications like computer games. The good battery runtimes complement that. The bright, Full HD screen strikes the eye immediately. Unfortunately, HP only relies on a viewing-angle dependent screen here. The Pavilion's input devices are satisfactory, although the keyboard is not really recommendable for professional typists. HP has to be criticized for its warranty period of 12 months. Manufacturers of comparable laptops offer longer periods here. The performance of Lenovo's IdeaPad Z50-70 is on par with the Pavilion. 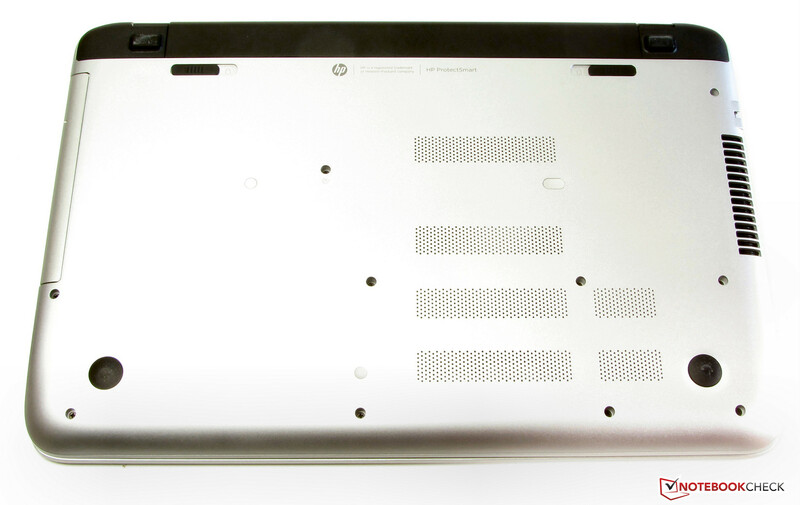 Its advantage over the HP laptop is its big maintenance cover. Acer's Aspire V5-573G scores with more gaming power, better battery runtimes, and a higher-quality casing. The input devices of HP's Pavilion. ...keep the lid firmly in position. The speakers are located above the keyboard. ...and has a capacity of 41 Wh. 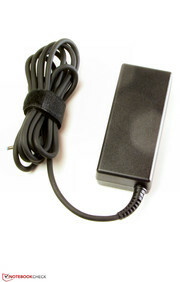 The power supply has a weight of 361 grams (including its cord). It provides a power output of 65 watts. The bright Full HD screen. 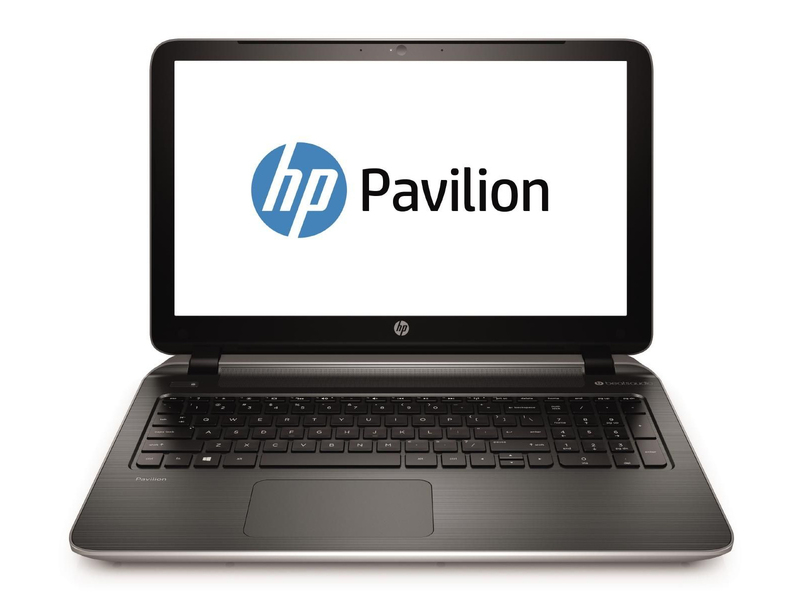 Hewlett Packard only includes a 12-month warranty on its Pavilion. That can't be called good service. Lenovo IdeaPad Z50-70, Acer Aspire V5-573G, Asus X550LB-NH52, Lenovo G510, Acer Aspire E5-571G-536E, Acer Aspire E1-572G, Asus F550LN-CN89H, HP Compaq 15-a024sg.